Comparative morphological studies on fish retinas are abundant and usually interpret the structural differences as adaptations to environmental factors (cited from Van der Meer et al., 1995). However, these interpretations may well be biased by differences which are not considered in the comparisons. For instance, the species studied are often taxonomically unrelated, which may imply differences in basic physiological properties of the retinas, in feeding behaviours or in diets. These biases are examples of the pitfalls involved in a fairly common approach to ecomorphology in which structure is directly linked with environmental factors without considering the biological nature of the structure-environment relationship. Haplochromine cichlids of Lake Victoria are characterized by little genetic divergence and high ecological radiation (Sage, et al., 1984; Verheyen, et al.,1985; Kornfield, 1990). The present study is focused on closely related zooplanktivores from Lake Victoria of approximately the same size. Detailed of their diet compositions, spatial distribution and measurements of the light conditions of their natural habitats have been made. Some of these species show high degree of habitat overlap. Because cichlids search their food mainly by vision (Fryer & Iles,1972), differences in visual capacities among these zooplanktivores provide the potential to avoid or minimize food-competition and may underlie resource-partitioning in sympatric haplochromines. All investigated specimens were wild-caught adults belonging to endemic zooplanktivorous species from Lake Victoria. They involve Haplochromis argens, H. pyrrhocephalus, H, heusinkveldi, H. reginus, H, megalops, H. piceatus, laparogramma, H. supramacrops and H. dusky argens. All specimens were collected by day, fixed in 10% formalin after partial decapitation and sent to the laboratory in Leiden. The standard length (SL, as defined by Barel et al., 1977) and the diameter of the isolated eye-lens were measured. Whole eyes were dehydrated and embedded in paraplast or paramat. Semi-thin (5 mm) tangential sections were made on a Leitz microtome with a steel knife using a graduated location-device with independent axial and radial mobility (Van der Meer & Anker, 1986) to determine the original position of the sections with respect to the falciform process which is always located ventrally. With this technique data could be collected from similar locations in all specimens. Using a microtome with a glass knife, transverse sections of exactly 3 mm thickness were obtained from Epoxy-resin embeddings of several eyes of a number of species. The relatively large transverse sections were deplastisized in a 3% NaOH-ethanol solution and coated with celloidine to improve adhesion to the slides (Noorlander, 1986). All sections were stained with hematoxylin and eosine. Counts of cells and nuclei were made using an eye-piece micrometer mounted on an Olympus microscope with an oil-immersion objective at a magnification of 1000x. Four species are of special interest as they were all caught at the same Butimba/Kissenda Transect of the Mwanza Gulf, suggesting much habitat overlap. More detailed examinations revealed that H. argens permanently dwelled near the surface and H. reginus remained in the lower regions closer to the bottom. H. hiatus and H. pyrrhocephalus showed a high degree of habitat overlap, halfway the water pillar during the day and migrating upwards at night. 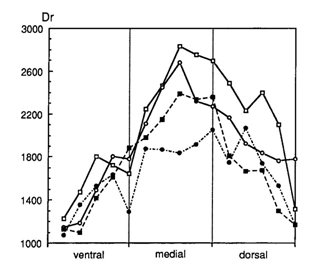 The distribution of the rods was measured in dorsal-ventral sections, generally providing the highest rod densities in the dorsal-medial regions and the lowest densities in the ventral parts of the retina. Contradicting the expectations, the highest rod densities were found in the surface dweller H. argens and the lowest densities in the benthic species H. reginus. Only in the very large eyes of H. supra macrops (r = 2,3 mm), similar rod densities as in H. argens were found. 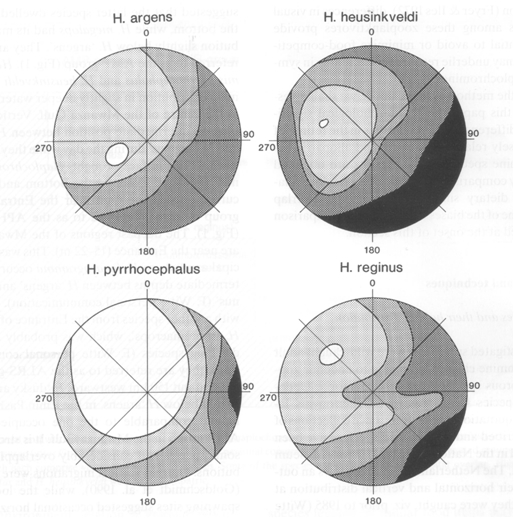 H. supra macrops was caught at much greater depths than H. reginus where photopic vision had probably become impossible and the small double cones represented degeneration of his system. In all species the density and size of the cones showed variations depending on the retinal region. Highest densities of small cones were found in the caudal/ventral part of the retina and the large cones in the medial/rostral regions. Functionally such a distribution is attuned to detail discrimination in front of the snout and to predator recognition in a more lateral direction. 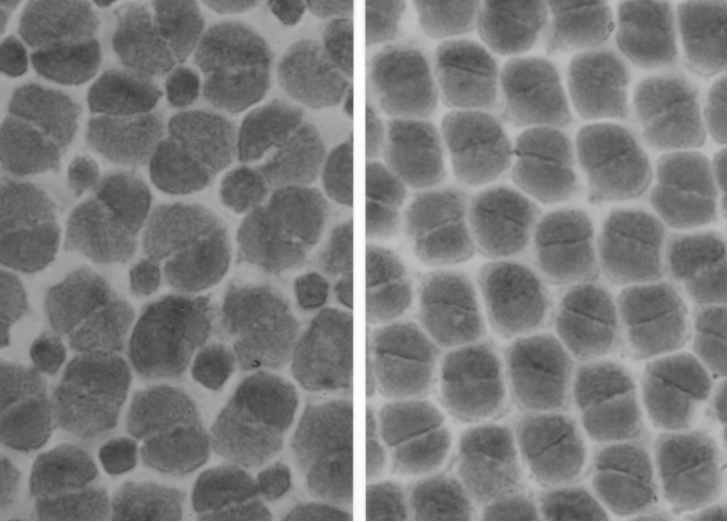 From a developmental point of view the distribution may be caused by differentiated cell division and growth from the retinal margin towards the centre. A specific difference in ratio between double and single cones was observed, with the most remarkable contrast between the regular square pattern of four double cones surrounding a single cone in H. argens and the absence of single cones in the row pattern of H. reginus. When comparing similar retinal regions, the more densely packed double cones of H. reginus also appeared to be slightly larger than the ones of H. argens, thanks to the omission of single cones. The intermediate species with their large habitat overlap showed less regular cone patterns, but a more remarkable difference in cone size and density. H. hiatus had densely packed small cones and the largest (double) cones were found in H. pyrrhocephalus. These observations seem to coincide with the diets of the two species. Stomach contents of H. pyrrhocephalus comprises mainly zooplankton by day and Chaoborus at night, whereas H. heusinkveldi also consumed smaller particles as blue-green algae. The presence of large retinal regions with high resolution in the latter species could therefore be interpreted as an adaptation to the detection of small food items. Elaborating on Lythgoe’s (1968) contrast hypothesis, McFarland & Munz (1975) distinguished various ways of visual prey detection: the prey may appear as silhouette against a light background or as a bright (reflective) object against a dark background. The photo-contrast may be enhanced by the spectral sensitivity of the photopic system. The detection of a reflecting target against a dark background is best performed if the photopigments are offset from the spectral composition of the background light (and match the reflected light). The contrast of a silhouette, on the other hand, is enhanced if the photopigments match the spectral composition of the background light (Munz & McFarland, 1977). With its well developed blue sensitive single cones H. argens was best equipped for prey detection in its surface habitat, where the background light was dominated by the short wave light due to Rayleigh scattering (Lythgoe, 1979). With their poorer short wave sensitivity due to lower numbers of smaller single cones, the deeper living species H. pyrrhocephalus and H. heusinkveldi were forced to detect their planktonic prey in upwards viewing against a brighter background dominated by medium/long wave light. The otherwise transparent Chaoborus larvae have dark eye-spots which too could have been detected against the downwelling light during the upwards migration in the evening. Chaoborus larvae also appear to be highly reflective (laboratory observations) and can be spotted against the darker background at downwards and sidewards viewing, maybe even when they reflect the sky light at night. At dawn, the reflections caused by Chaoborus larvae would have been spotted most successfully with an offset system. The reduced blue sensitivity could therefore be an asset in H. pyrrhocephalus and H. heusinkveldi as it resulted in contrast enhancement of these bright objects, that could further be spotted against the darker lateral background during the downward migrations at dawn.